Hello everyone.....this is going to be a relatively short post tonight. My head is killing me and there has been a TON of drama here. Nothing I care to get into at the moment, maybe when I am able to think straight and have time to sleep on it. All I will say about it at this time is I will really be leaning on my blog friends more than ever and will REALLY need your support and understanding as I go thru this. So, onto my challenge entry. 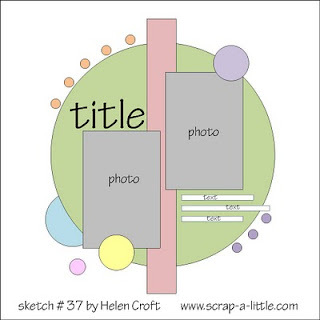 Helen Croft has this super cute little sketch on her site Scrap A Little. She is one of my absolute favorite sketch designers!!!! And I had this die cut that I have been dying to work with but wasn't sure what to use it for and then along came this sketch!. I flipped it around a bit and added a few things.......and right off the bat I will apologize for my first photo.....I didn't realize when I took it that my ribbon was falling off.....LOL. I had another photo I was going to use, with the ribbon intact, but I had managed to cut off part of the top of my page while photographing it. I'm tellin ya......it has been a ROUGH night!!!! So use your imagination with the ribbon......lol. As if you can't tell....the title is "Christmas Cuties" and this is Brandon (top) and Jesse(bottom) from a couple of Christmases back. Back when they were so cute and sweet. I'm longing for those days right now :( And those are Christmas lights on Jesse's head......I love that photo! I've used mostly Pink Paislee's "Mistletoe & Co" collection....which I LOVE! Background paper is Basic Grey's "Basic manila" ledger paper. my letters here are from Crate Paper. The "C" you see here was actually attached to the outside of the darling little cannister it came in with jute. and it also had a hole punched thru it.....I had to use it cuz I was short a "C" in putting this layout together. So I just wrapped it in some red embroidery floss and tied a sweet little bow to cover it. 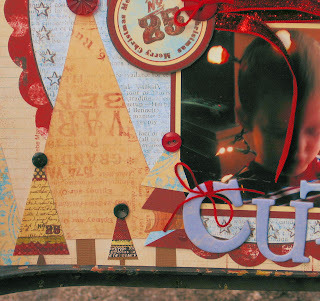 I also used just some ribbon from my stash, it doesn't show well here but it is really very glittery :) Some bazzill basics card stock to mat the photos and other letters from Cosmo Cricket's Tiny Type. Oh, almost forgot the little "Be Jolly" guy at the top is Creative Imaginations adhesive chipboard. So sorry about the drama. Lovely page. Must check out that blog. Sorry you're having drama...of course I'm here for you when you're ready...sending you a hug my friend! 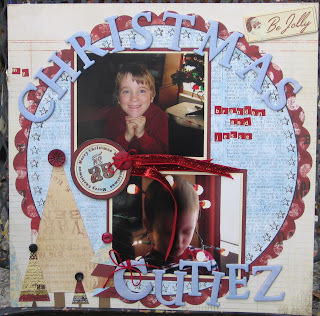 GORGEOUS layout...you are one mega talented lady!! This is super cute! You did such a great job! I love the papers!